A brilliant and often brutal account of the dual lives of Muhammad Ali and Joe Frazier and the long-running feud between them. Be prepared to have your previously held opinions challenged, then shattered, by this thought-provoking study. 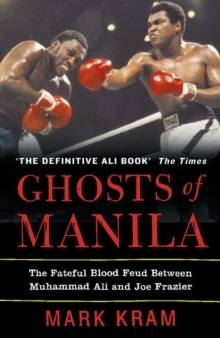 Set against the backdrop of the `Thrilla in Manila', the epic 1975 battle which many aficionados consider the greatest heavyweight fight ever, Ghosts of Manila offers a dramatic insight into the 30-year feud between Muhammad Ali and Joe Frazier. Celebrated American sports journalist Mark Kram has spent nearly the same amount of time preparing to write this book - and the result is a hugely impressive piece of research and social history. When Ali and Frazier met in Manila for the third act of their trilogy of fights, their rivalry had spun out of control. More than a clash of personalities and fighting styles, the rivalry, inflamed by the media, took on overtones of politics and race. But in the aftermath of Manila the hype no longer mattered: one man was left with a ruin of a life; the other was battered to his soul. Frazier is now in an advanced state of blindness, still consumed by hate; Ali's once agile and powerful body is withered by the grip of Parkinson's disease. Kram's book begins with the boxers themselves - who they are and were. They began as friends, with a genuine, if grudging, respect for each other. They were turned into enemies as much by pride as forces over which they had no control.